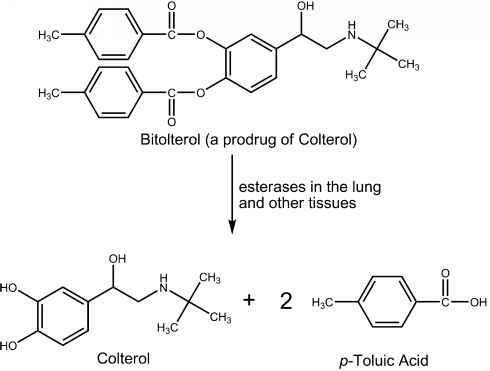 lung and other tissues to produce the active agent (colterol) affording sustained bronchodilation. The DO A of a single dose of the prodrug bitolterol is twice that of a single dose of colterol, permitting less frequent administration and greater convenience to the patient. Colterol is then metabolized after pharmacological action by COMT and conjugation. Ritodrine (Yutopar) is a selective [2-agonist that was developed specifically for use as a uterine relaxant. Its uterine inhibitory effects are more sustained than its effects on the cardiovascular system, which are minimal compared with those caused by nonselective [-agonists. The cardiovascular effects usually associated with its administration are mild tachycardia and slight diastolic pressure decrease. Usually, it is administered initially by intravenous infusion to stop premature labor and subsequently it may be given orally. Indirect-acting sympathomimetics act by releasing endogenous NE. They also enter the nerve ending by way of the active-uptake process and displace NE from its storage granules. As with the direct-acting agents, the presence of the catechol OH groups enhances the potency of indirect-acting phenylethylamines. However, the indirect-acting drugs that are used therapeutically are not catechol derivatives and, in most cases, do not even contain an OH moiety. In contrast with the direct-acting agents, the presence of a [-hydroxyl group decreases, and an a-methyl group increases, the effectiveness of indirect-acting agents. The presence of nitrogen substituents decreases indirect activity, with substituents larger than methyl groups rendering the compound virtually inactive. Phenylethylamines that contain a tertiary amino group are also ineffective as NE-releasing agents. Given the foregoing structure-activity considerations, it is easy to understand why amphetamine and ^-tyramine are often cited as prototypical indirect-acting sympathomimetics. Because amphetamine-type drugs exert their primary effects on the CNS, they are discussed in more detail in Chapter 15. This chapter discusses those agents that exert their effects primarily on the periphery. Hydroxyamphetamine (Paredrine) is an effective, indirect-acting sympathomimetic drug. It differs from amphetamine in the presence of p-OH group and so it has little or no CNS-stimulating action. It is used to dilate the pupil for diagnostic eye examinations and for surgical procedures on the eye. It is sometimes used with cholinergic blocking drugs like atropine to produce a mydriatic effect, which is more pronounced than that produced by either drug alone. Propylhexedrine (Benzedrex) is another analog of amphetamine in which the aromatic ring has been replaced with a cyclohexane ring. This drug produces vasoconstriction and a decongestant effect on the nasal membranes, but it has only about one half the pressor effect of amphetamine and produces decidedly fewer effects on the CNS. Its major use is for a local vasoconstrictive effect on nasal mucosa in the symptomatic relief of nasal congestion caused by the common cold, allergic rhinitis, or sinusitis. L-(+)-Pseudoephedrine. (Sudafed, Afrinol, Drixoral) is the (S,S) diastereoisomer of ephedrine. 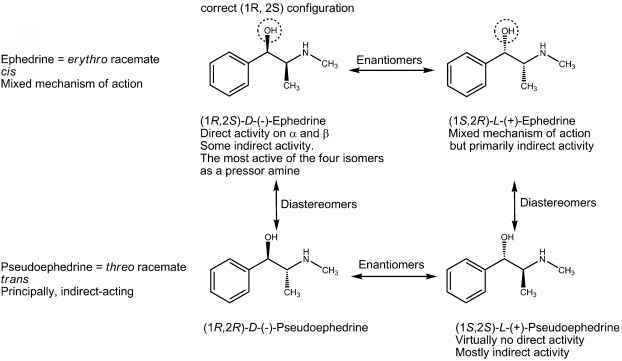 Whereas ephedrine has a mixed mechanism of action, l-(+)-pseudoephedrine acts mostly by an indirect mechanism and has virtually no direct activity. The structural basis for this difference in mechanism is the stereochemistry of the carbon atom possessing the j-OH group. In pseudoephedrine, this carbon atom possesses the (S) configuration, the wrong stereochemistry at this center for a direct-acting effect at adrenoceptors. Although it crosses the BBB (log P = 1.05, pKa = 9.38), l-(+)-pseudoephedrine's lack of direct activity affords fewer CNS effects than does ephedrine. It is a naturally occurring alkaloid from the Ephedra species. This agent is found in many OTC nasal decongestant and cold medications. 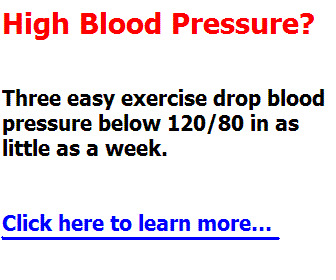 Although it is less prone to increase blood pressure than ephedrine, it should be used with caution in hypertensive individuals, and it should not be used in combination with MAO inhibitors. Those phenylethylamines considered to have a mixed mechanism of action usually have no hydroxyls on the aromatic ring but do have a j-hydroxyl group. D-(—)-Ephedrine. The pharmacological activity of (1R,2S)-d-( —)-ephedrine resembles that of E. The drug acts on both a- and j-receptors. Its ability to activate j-receptors probably accounted for its earlier use in asthma. It is the classic example of a sympathomimetic with a mixed mechanism of action. by either MAO or COMT and therefore has more oral activity and longer DOA than E. Like many other phenyliso-propylamines, a significant fraction of the drug is excreted unchanged in the urine although it can be p-hydroxylated and N-demethylated by cytochrome P450 mixed-function oxidases. Because it is a weak base, its excretion can be accelerated by acidification of the urine. Ephedrine has two asymmetric carbon atoms; thereby creating four optically active isomers. The erythro race-mate is called ephedrine, and the threo racemate is known as pseudoephedrine (^-ephedrine). Natural ephedrine is the d ( —) isomer, and it is the most active of the four isomers as a pressor amine. This is largely because of the fact that this isomer has the correct (1^,23) configuration for optimal direct action at adrenergic receptors. Ephedrine decomposes gradually and darkens when exposed to light. The free alkaloid is a base, and an aqueous solution of the free alkaloid has a pH above 10. The salt form has a pKa of 9.6. Ephedrine and its salts are used orally, intravenously, intramuscularly, and topically for various conditions, such as allergic disorders, colds, hypotensive conditions, and narcolepsy. It is used locally to constrict the nasal mucosa and cause decongestion and to dilate the pupil or the bronchi. 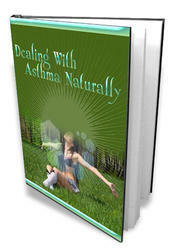 Systemically, it is effective for asthma, hay fever, and urticaria. This drug is an alkaloid that can be obtained from the stems of various species of Ephedra. Ma huang, the plant containing ephedrine, was known to the Chinese in 2000 bc, but the active principle, ephedrine, was not isolated until 1885. In recent years, various companies have begun marketing extracts of Ephedra shrubs for such purposes as weight loss and enhancement of athletic performance. Herbalists also market them as "alternative medicines" for cold and cough relief. It has been estimated that nearly one third of young, obese women have used a weight-loss supplement containing Ephedra5 Pharmacists must be aware that some patients may be taking such ma huang containing herbal remedies or dietary supplements in addition to regulated drugs that could lead to serious adverse reactions. Phenylpropanolamine (Propadrine) is the n-desmethyl analog of ephedrine and thus has many similar properties. Lacking the n-methyl group, phenylpropanolamine is slightly more polar, and therefore does not enter the CNS as well as ephedrine. This modification gives an agent that has slightly higher vasopressive action and lower central stimulatory action than ephedrine. 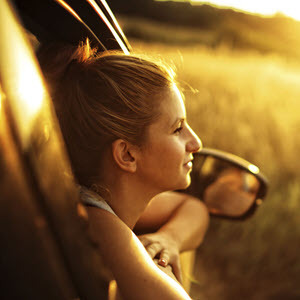 Its action as a nasal decongestant is more prolonged than that of ephedrine. It is orally active. Phenylpropanolamine was a common active component in OTC appetite suppressants and cough and cold medications until 2001 when the Food and Drug Administration (FDA) recommended its removal from such medications, because studies showed an increased risk of hemorrhagic stroke in young women who took the drug. Metaraminol (Aramine) is the n-desmethyl-a-methyl analog of phenylephrine. It possesses a mixed mechanism of action, with its direct-acting effects mainly on a1-receptors. It is used parenterally as a vasopressor in the treatment and prevention of the acute hypotensive state occurring with spinal anesthesia. It also has been used to treat severe hypotension brought on by other traumas that induce shock. are imidazoline competitive a-blockers, and primarily of historical interest. The structure of tolazoline are similar to the imidazoline a1-agonists, but does not have the lipophilic substituents required for agonist activity. The type of group attached to the imidazoline ring thus dictates whether an imidazoline is an agonist or a blocker. Phentolamine is the more effective a-blocker, but neither drug is useful in treating essential hypertension for following reasons. (a) Tolazoline and phentolamine have both a1- and a2-blocking activity and produce tachycardia. Presumably, the blocking actions of these agents at presynaptic a2-receptors contribute to their cardiac stimulatory effects by enhancing the release of NE. Both agents also have a direct vasodilatory action on vascular smooth muscle that may be more prominent than their a-blocking effects. (b) The blocking action of tolazoline is relatively weak, but its histamine-like and acetylcholine-like agonistic actions probably contribute to its vasodilatory activity. Its histamine-like effects include stimulation of gastric acid secretion, rendering it inappropriate for administration to patients who have gastric or peptic ulcers. It has been used to treat Raynaud syndrome and other conditions involving peripheral vasospasm. Tolazoline is available in an injectable form and is indicated for use in persistent pulmonary hypertension of the newborn when supportive measures are not successful. Phentolamine is used to prevent or control hypertensive episodes that occur in patients with pheochromocytoma. It also has been used in combination with papaverine to treat impotence. Agents in this class, when given in adequate doses, produce a slowly developing, prolonged adrenergic blockade that is not overcome by E. They are irreversible a-blockers, because jS-haloalkylamines in the molecules alkylate a-receptors (recall that jS-haloalkylamines are present in nitrogen mustard anticancer agents and are highly reactive alkylating agents). Although dibenamine is the prototypical agent in this class, it is phenoxybenzamine that is used therapeutically today. The mechanism whereby jS-haloalkylamines produce a long-lasting, irreversible a-receptor blockade is depicted in Figure 16.14. The initial step involves the formation of an intermediate aziridinium ion (ethylene iminium ion). The positively charged aziridinium ion electrophile then reacts with a nucleophilic group on the a-receptor (if this occurs in the vicinity of the a-receptor), resulting in the formation of a covalent bond between the drug and the receptor. Unfortunately, these nonselective drugs alkylate not only a-receptors but also other biomolecules, leading to their toxicity. It is thus used only to relieve the sympathetic effects of pheochromocytoma.